The Strike King Rage Tail Single Tail Grub adds the revolutionary action derived from the patented Rage Tail design to the grub market causing all others to become obsolete. 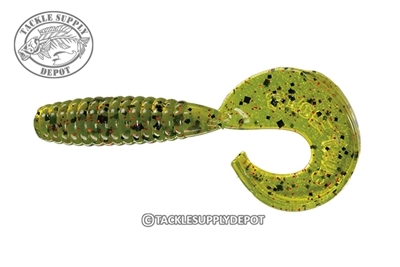 The Single Tail swimming grub has been a favorite of many anglers for years especially Smallmouth fishermen and is commonly rigged on a darter jig head or as a trailer on a swim jig. Now with the Rage Tail design this grub will replace all others. Each Rage Tail lure has a unique and exclusive Tail design and is engineered like no other soft plastic bait. Each is designed with a specific purpose and uses customized hi-grade plastics for superior action. All Rage Tail baits are packaged in individual clam shell packages to hold its shape until use. This means higher quality and NO deformed bodies!! Great trailer on a chatter bait or swim jig!